Peridot has been described as the gem of the sun. Treasured for its bright lime-green color, mperidot is both a day stone and a night stone - which means it keeps its brilliant color in shining sunlight and under artificial light. For millennia, peridot was a favorite among pharaohs, emperors, and other nobility because it was thought to bring the wearer divine inspiration and good fortune. Today, peridot is cherished for its rich, springtime color. It is one of the few precious gems that can look whimsical and playful yet classically elegant at the same time. 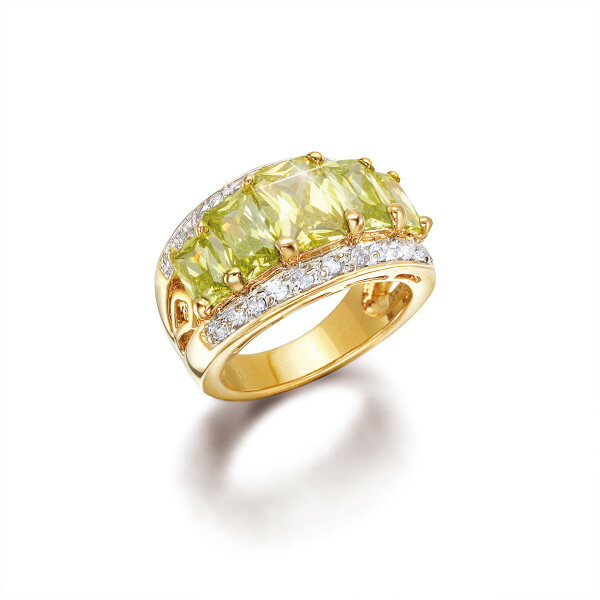 This breathtaking ring is specially designed to emphasize the magnificent peridot-green color of the 5 main crystals. Emerald-cut for superior sparkle, the crystals are set in slightly cascading sizes that flow down thesides of the ring. Twenty sparkling clear DiaFlame® gems line the sides of the main crystals to reflect the light and make this work of art virtually glow with vibrant color. The gold-tone ring's stylish design and distinctive gem color makes it the perfect accent to any outfit. Available in whole sizes only from 5 to 10, this magnificent ring is a versatile addition every woman's wardrobe.